Having spent a week in Tuscany, I came back keen to spend a bit more time exploring the food culture and trying out a few things in the kitchen. While I was there, I had pasta - of course - and gnocchi. But I didn’t have pancakes - locally known as crespelle. And the Florentine dish with pancakes - Crespelle alla Fiorentina - looked like it would make a fine lunch so nudged its way to the top of my queue. This is pancake as pasta really. 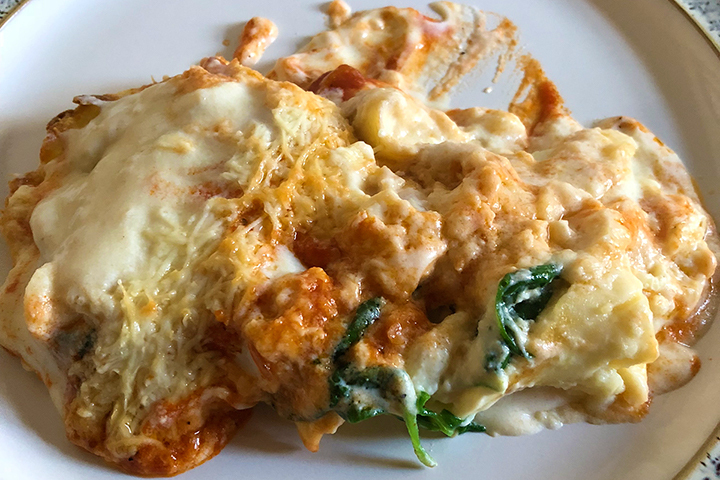 Pancakes are filled with ricotta and spinach and folded, then covered with a béchamel sauce dotted with a thick tomato passata and covered in pecorino cheese and baked. I adapted the quantities to fit and a couple of other details, but the basic recipe came from Emiko Davies’ excellent book “Florentine’ which I bought immediately after I’d stayed at Il Canto Del Maggio and saw it there. It’s a great book which I wholeheartedly recommend - not least because it really gives you the sense of place and context that surrounds the food - not just the food, but also the story of the food. For this, you make a rich tomato sauce but you only need a few tablespoons of it at most. My solution to that is to make the sauce, and then put the bulk of it aside to use as a pasta sauce for a subsequent meal. I’ve said that these quantities feed four - as a light lunch. The original quantities were very generous, and we’re all trying to eat slightly smaller portion sizes these days. But if you’re looking for hearty and filling, double the quantities for everything except to tomato sauce. Peel and finely chop the shallot and the garlic cloves. Fry them lightly in the olive oil until softened but not coloured. Add the passata and bring to the boil. Add a little salt, and then reduce the temperature to a simmer and cook for 20-25 minutes until it has thickened to a rich consistency. While that is simmering, make the batter. Add 75g of the flour to a bowl and add 1 egg and 30ml of the milk. Whisk together until a smooth paste, and then add the melted butter, and then bit by bit another 45ml of the milk. The batter should be very liquid and without lumps. Cover the bowl with clingfilm and put in the fridge to rest for half an hour. Once the tomato sauce is finished, remove from the heat and set to one side. Preheat the oven to 180ºC / 160ºC fan oven. Make the béchamel sauce. Put the 25g butter in a pan and melt. Add the remaining flour and mix together and cook for a minute or two. Then add a little of the remaining milk and mix together until smooth - then a bit more and repeat. Finally add the rest of the milk and a pinch of salt, and bring to a gentle boil. Cook until the sauce has thickened to the consistency where it will coat the back of a wooden spoon - probably about ten minutes. When that’s done, taste and adjust the seasoning, add a light grating of nutmeg, and then remove from the heat and set aside. Cook the spinach with a tablespoon of water in a pan with a lid - so you’re steaming the leaves in the tiniest amount of water. It should wilt quickly - just a minute or so. Don’t cut the stalks of the spinach (there a lot of the flavour resides) and don’t squeeze the cooked spinach. Simply mix it in a bowl with the ricotta and the remaining egg. Finally, cook the pancakes. Heat a little olive oil in a small frying pan and put in a large spoonful of the batter - enough to thinly coat the pan. Cook over a medium heat until the top of the pancake is just dry, then turn over for a few seconds before removing it and doing the next one. In the centre of each pancake, put approximately a tablespoon of the spinach and ricotta filling, and fold the pancakes into half, and then into quarters. Place them upright in a casserole dish. When you’ve filled the dish (the quantities above will give you enough for about six thin pancakes) pour the béchamel sauce over the top. Put a couple of tablespoons of the rich tomato sauce on top and just work them lightly into the sauce, so that it becomes stained with tomato. Add as much grated Pecorino over the top as you like (I added a lot) and put into the oven for 15 minutes until the cheesy top has gone golden brown. Serve. As mentioned above, you make for more of the tomato sauce that you need for this recipe. You can divide this into meal-sized portions and freeze or, if you think you will use it quite quickly, it should keep covered in the fridge perfectly well for a week. I was using up some spinach here, so I used half a bag. If you’re opening a bag to do this recipe, store the remaining spinach wrapped in paper towels in a clean container and keep in the fridge. It should last between 7 to 10 days (a lot longer than if you leave it in the bag you bought it in).